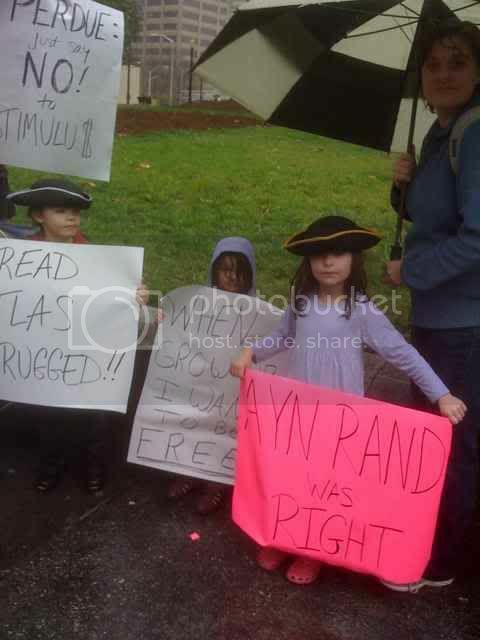 I’m not surprised to hear, via Instapundit, that sales of Ayn Rand’s books are reportedly rising. In fact, I’ve spotted quite a few “Who is John Galt?” bumper stickers cropping up. Forget the commentators. 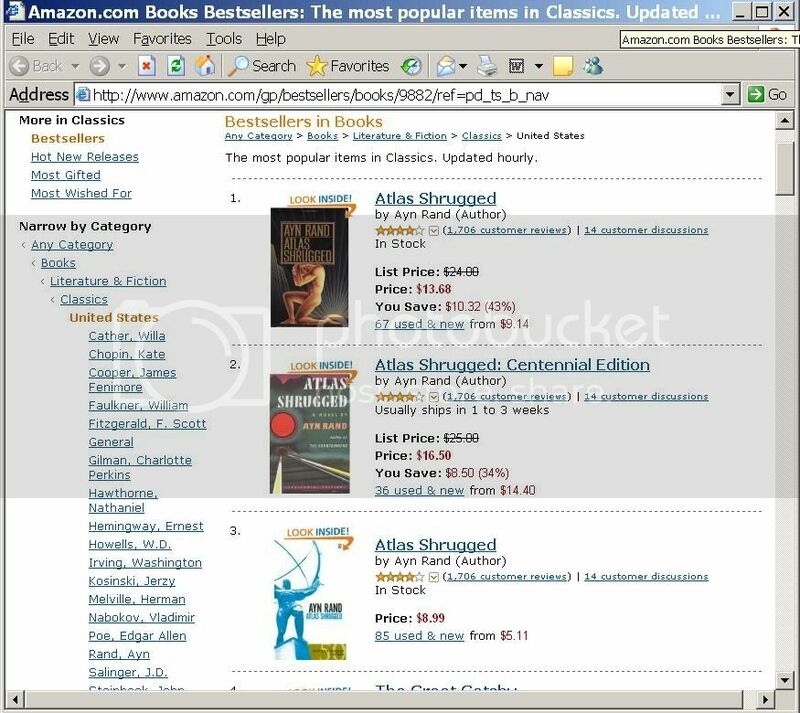 Apparently they're not the ones buying Atlas Shrugged. iTunes has a section for audio books, and Atlas is now the 4th most popular download in the classics category. That's happening at "tea Party" protests all over the country. Betsy, those are neet pictures, thanks. Some of the posts from this thread have been split off into a new topic titled "Taking Children to Protests" (link). On Glenn Beck's radio yesterday's show he read from the article on sales of Atlas Shrugged soaring as part of his ongoing theme of mocking Newsweek's claim that "we are all socialists now". He sardonically reports that this is evidence that we all want socialism and that the economic recovery is already here because people are buying the book in order to burn it now that they have so much money resulting from Obama's magical socialist cure. Those interested in understanding the morality of capitalism can learn more in Ayn Rand’s The Virtue of Selfishness--which, at #12 in the Classics category, is setting records of its own. AT THIS MOMENT, AYN RAND'S BOOKS HOLD 7 PLACES OUT OF THE TOP 25 ! Does anyone know if Amazon ever makes demographic data available for book sales? It would be useful to know the age distribution of those A.S. purchasers. Here's the current statistics from the "Atlas Shrugged" page on Facebook. As I pointed out in my report from the Troy Tea Party at http://forums.4aynrandfans.com/index.php?s...amp;#entry91982 , I found interest in Ayn Rand among participents was very high. Not directly related to book sales but this weekend I participated in a 13-hour mountain bike race. I was taking a break while my team-mate was out on the course and overheard someone at the next campsite mention Ayn Rand and Atlas Shrugged. I wandered over and joined their conversation. None of them had read the book but they had heard some of the basics. I had a copy of AS in my truck with a lot of post-it notes stuck in various pages. I flipped through the book and shared some of the more central points. I almost felt like a street preacher. I ended up giving away my copy of the book, notes and all, and noticed the rider reading it under a lantern later that night. Here's the latest from ARI -- the "tripling" reported earlier was no momentary SPIKE, but a 4-month SURGE! have tripled in the first four months of 2009 compared to the first four months of 2008.
have been sold to date. My dentist read Atlas on my recommendation; then had every member of his staff read it. Now my landlord is reading it. When I was down in Texas over the 4th I learned that some of my old friends were reading or going to read Atlas Shrugged. After interacting with lots of people down there I cannot emphasize enough how ripe of an opportunity there is for Objectivism/Atlas Shrugged to spread like wildfire. It's as if a large number of very hard working, very good people are finally reaching a breaking point with the escalating government taxation/regulation that is intruding in their lives, and they are at a pivotal moment when they need someone to give them the same speech that Francisco gave Rearden, and Galt gave many others. six months still to go before the close of the year. Get that? The spurt at the beginning of the year has CONTINUED, UNABATED. It is a SURGE! I went to the university library a little while ago to get a book; while I was sitting at the check-out counter waiting I saw a shelf labeled "Reserved". Sitting prominently on that shelf was an enormous copy of Atlas Shrugged.